Figure A. RPE conjugated mouse anti human CD3 (MCA463PE) and FITC conjugated mouse anti human CD69 (MCA2806F) on unstimulated cells. 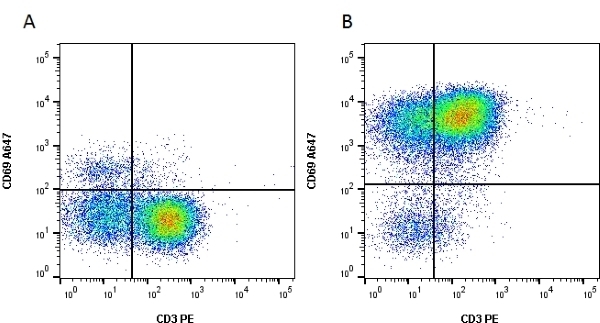 Figure B. RPE conjugated mouse anti human CD3 (MCA463PE) and FITC conjugated mouse anti human CD69 (MCA2806F) on cells incubated with Cell Stimulation Reagent (without Brefeldin A) (BUF076A). All experiments performed on human blood gated on lymphocytes. Data acquired on the ZE5™ Cell Analyzer. Figure A. RPE conjugated mouse anti human CD3 (MCA463PE) and FITC conjugated mouse anti human CD154 (MCA1968F) on unstimulated cells. 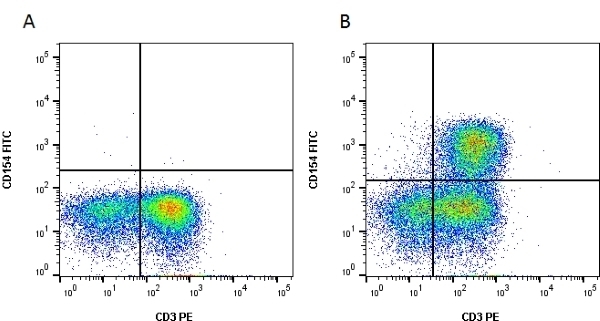 Figure B. RPE conjugated mouse anti human CD3 (MCA463PE) and FITC conjugated mouse anti human CD154 (MCA1968F) on cells incubated with Cell Stimulation Reagent (without Brefeldin A) (BUF076A) for 5 hours. All experiments performed on human blood gated on lymphocytes. Data acquired on the ZE5™ Cell Analyzer. Cell Stimulation Reagent (without Brefeldin A) 500x is a mixture of Phorbol-12-myristate-13-acetate (PMA) and ionomycin. PMA activates protein kinase C and ionomycin acts as a Ca2+ ionophore allowing movement of Ca2+ across membranes. Activation of cells with PMA and ionomycin leads to an increase in surface expression of certain markers such as CD69 and CD154 and the production of cytokines such as IL-2, IFN-gamma and TNF-alpha. Note: Aliquot product to avoid repeat freeze-thawing. Time and culture conditions may need to be optimized. To detect intracellular staining following activation, the Cell Activation Reagent (without Brefeldin A) 500x (BUF076A) can be used with Monensin Solution (BUF074) or Brefeldin A Solution 1000x (BUF075).